Be sure to check the update at the very end of the article. I’ve written many times about how skeptics need to take care when linking to bad information that we intend to rebut. Because links are used by search engines to measure the importance of content, linking to a piece of pseudoscience or misinformation (in the process of rebutting or debunking it) might actually have the effect of making it more visible to others. That’s not desirable. I would even say it is unethical to increase the visibility of such content, insofar as it has the potential to cause harm. If you doubt my thesis, read this New York Times article. It tells the story of how negative reviews of a particular business actually had the effect of catapulting that business to the top of the relevant search result, thereby bringing it more customers. Talk about a skeptic backfire! In blog posts and other web content, I’ve long recommended a best practice for skeptics to use the HTML NOFOLLOW attribute to prevent this from happening. It’s straightforward, it’s an industry standard and there’s no good reason not to do it. Australian skeptic Joel Birch even built a WordPress plugin to make it easy for bloggers on that platform. In another post, I’ve documented how a similar problem is now happening in social media settings. Although social media websites usually NOFOLLOW user supplied links, the importance of Twitter & Facebook has led many search engines and analytics packages to ignore that use of NOFOLLOW. Not only that, but it is now known that linking to content in Facebook (even in private messages) actually adds to the “like” count on that content! All of this activity serves to boost the visibility of nonsense and makes it look more popular than it is. It matters not how brilliantly snarky you were in your Tweet, the measuring algorithms only care about the fact that you included a link to the Daily Mail. This encourages publishing entities like newspapers to create more of the same crap. I think we can all agree this is not a good thing. Thus I’ve long recommended avoiding this by linking in your social media posts to a critical blog post or via the corresponding Doubtful News item instead. But with breaking stories and the like, there isn’t always such a good alternative. Courtesy of Eric Weiss at Skepticsonthe.net, I’ve become aware of another solution to this problem. 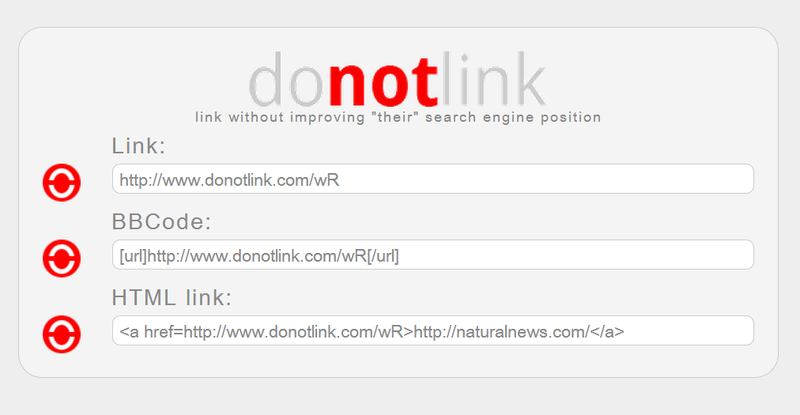 Donotlink.com works like a URL shortener, which many people use for practical reasons anyway in social media posts. But unlike regular URL shorteners, which generally do not interfere with the ability of Google and others to count links, Do Not Link takes several steps to make sure the link will not be counted. I’ve tested out the service, and it does work as described. From their home page, you paste in a URL you’d like to mention, and it hands back a short URL. It also returns a piece of BBCode for posting in forums (if that’s your thing), and a piece of HTML markup if you’d like to use this in a web page. I highly recommend all skeptics adopt this as standard practice when posting on social media. (Continue to use NOFOLLOW in conventional web links on your own site). Further, please point out this article to other skeptics who you observe linking directly to misinformation on social media. We need to make it a best practice to never do this, lest we all become inadvertent shills for the very things we are trying to debunk. Update Jan 2014: Changed last link in fourth paragraph to point to a newer relevant Skeptools post. Update Feb 2014: The new RBUTR Toolbar can now be used for the same purpose as Do Not Link, check it out! This entry was posted in Best Practice, How To, Social Media and tagged DoNotLink.com, Facebook, nofollow, seo, Twitter on August 13, 2013 by Tim Farley. Definitely also using this. Great job. As you know Tim, we have plans to develop a rbutr version of almost exactly this in the near future. The only difference really will be that we will also frame the linked to page in a rbutr frame, providing everyone who clicks through to the questionable content immediate immersion in to the skeptical world of rbutr. Thanks Tim, I will talk about this in my podcast too! One of the methods I employ when linking to the Australian Vaccination Network is to screenshot their entire page such as: http://www.danbuzzard.net/storage/avn-spam-nsw-mps.png and then link to it from the blog post. A less than ideal solution but sometimes the AVN delete their own pages, hence the need for a screenshot. Since screenshots aren’t convenient for people to read and no follow tags don’t work on twitter DoNotLink.com is certainly a welcome addition to the tool set. If you want a snapshot of a page that might get deleted, without linking directly either, webcitation.org can produce one on demand. I’d hope that this also prevents an uprating of the search ranking of the target page too, so that you wouldn’t need to use donotfollow to refer to the webcitation.org link. Reblogged this on crazy dumbsaint of the mind. Nice. I’ve made this handy bookmarklet that shares your current url to Facebook through donotlink.com It’s just a modified version of the official Facebook bookmarklet that I use all the time. Now everytime I want to share some bullth*t webpage I just type “fbdl” on the url bar and presto! Neat! But anyone else wanting to use this will need to change that 10 digit number in the middle to match their Facebpok account first, if I’m not mistaken. Huh. I didn’t notice that. I don’t think is an account number, though, since going to the bookmarklet site (https://www.facebook.com/share_options.php) while logged out gives different numbers with each reload. I think that might be a tracker number, some kind of identification for each bookmarklet. I’ve played arround a bit and repalcing that number with just “0” doesn’t break it. Wish I’d read this when you first published it. A must read for any blogger.